LiveTracking is great for sharing your location and effort levels with others you care about on your rides, runs, hikes and so much more. 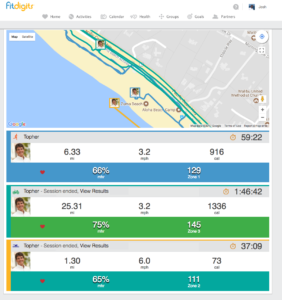 A Star member feature, LiveTracking tracks your efforts in near real-time as you run, walk, ride or do just about any activity. 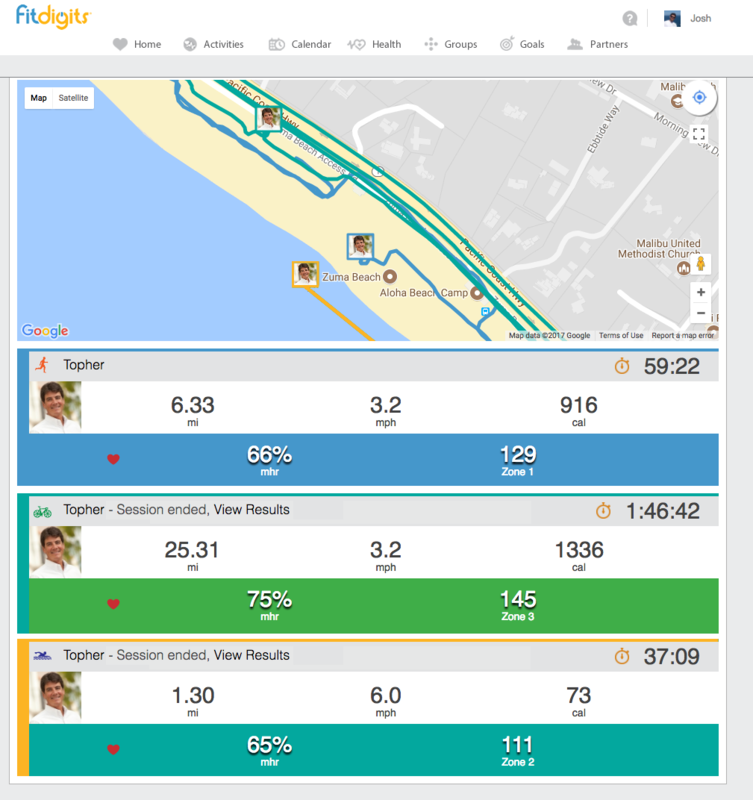 Perfect for trainers and group members, or even event managers to track participants in their events. View maps, courses, time, distance, pace, heart rate and even power/watts cranked out if you’ve got it. Tracking when your spouse will be home for dinner after their run. Monitoring fitness activities by those in your training group. Showing multiple people in multiple activities around the world in one place. Adding an extra level of safety knowing your loved ones know where you are. The bottom bar turns green when active and there is a good connection to the internet and the data is streaming. If there is no connection, the bottom bar will turn red, though you will continue tracking on the device and (if the connection isn’t lost more than 20 minutes) it should pick back up when a good connection is established again. To notify someone or share the URL for tracking the activity, tap on the gear icon within the workout, then tap Share LiveTracking. 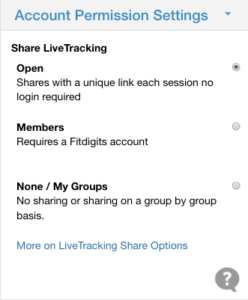 See LiveTracking Share Options below for more on how to manage who sees the link, is notified, and more. LiveTracking will end when the activity is stopped. To turn of / not enable LiveTracking, simply turn it off in the same place as it was turned on in the app. 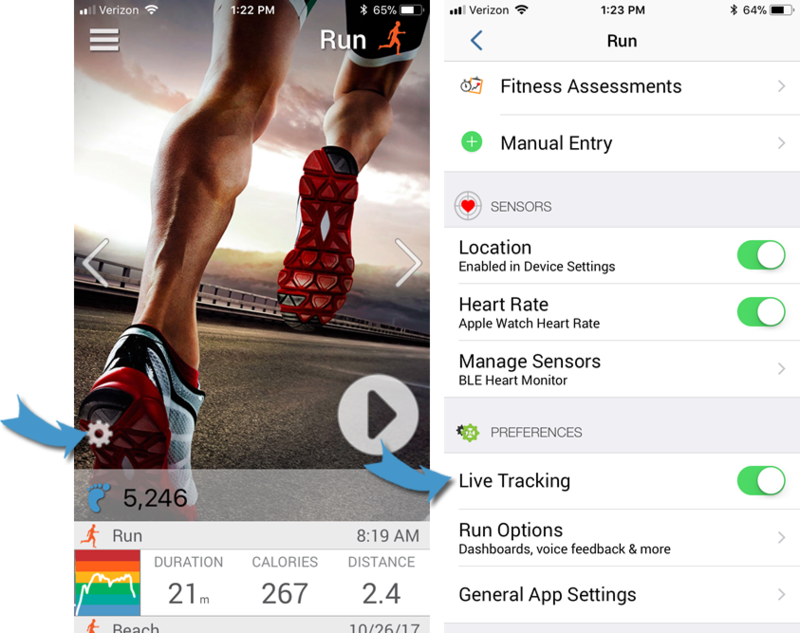 For individual shares, no session is visible, even when LiveTracking is turned on, until it is shared by tapping the LiveTracking icon in the workout (see above). However, once shared, the following rules apply to the view, depending on the option chosen in your online profile Account Permissions section, also accessible within the iOS app under Menu > Profile > Notifications > Other Notifications & Preferences. When a link is shared, anyone with that link will be able to view the session. The link times out 3 hours after the end of the session, and is unique per session. If a user has LiveTracking turned on and shares the link generated in their app, the person trying to view will need to have a valid Fitdigits account (free and available via downloading the app or creating online) and login to view the session. Or, as part of a Group permission setting, a group member may have access, see below for more on Group LiveTracking. When you first sign up for a group, or when going to edit your group Member Privacy & Sharing Permissions, you have the option of sharing your LiveTracking activities with the group. Each group member who has also agreed to share will be notified and be able to view the session when their fellow sharing member begins LiveTracking. Simply turn off this option if you do not wish to share with the group. The number of LiveTracking sessions is shown at the top. Tap in that area to see current sessions. This entry was posted in Tips and How Tos and tagged LiveTracking by Christopher Means. Bookmark the permalink.